Holding one another's hand in public is a privilege Stephen and I rarely get to enjoy. Of course, there are a tragically large number of lovers in this world who cannot hold hands in public without fear of antagonism, abuse and even arrest. Thankfully, our obstacles are mostly practical. You can't hold hands between two assistant wheelchairs, unless you can co-ordinate the pushers (neither of us can self-propel). You can't hold hands between powerchairs unless the controls are on alternate arms (although Stacey and Mia offer one beautiful solution to this). Scooters, however, provide the possibility of riding alongside one another and holding hands. I'm not all that great with a scooter, but just now we have access to two scooters and a broad and fairly lonely path between us, the woods and the beach. 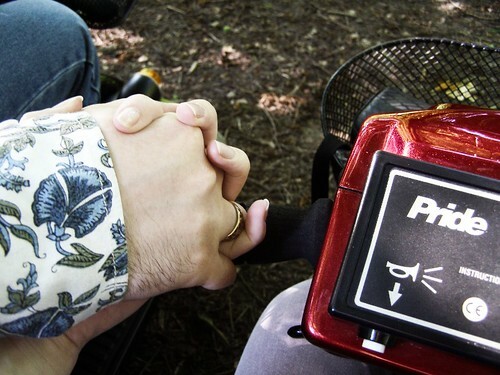 There is a special art to holding hands whilst driving mobility scooters. Not only do you have to be closely synchronised with the other person, but you have to gauge and respond quickly to the subtleties of the other scooter. Different machines slow or speed up more or less on a gradient or on different terrain. And nothing brakes or turns as quickly as an ambulant person can, even if you have the same reflexes (which I certainly don't). So in other words, it takes far more concentration and is ever so slightly hairy. We meander a great deal. And of course, we take up space. Which isn't necessarily a bad thing. Stephen is more self-conscious than I am, having been subject to a fair amount of harassment and hostility when out and about. He's lived in less friendly places and maybe as a young man, he is considered especially fair game to those kinds of people (not that disabled women are immune by any stretch, in fact we seem to get it nastier if less often). So Stephen is more conscious of the fact that we might be judged. 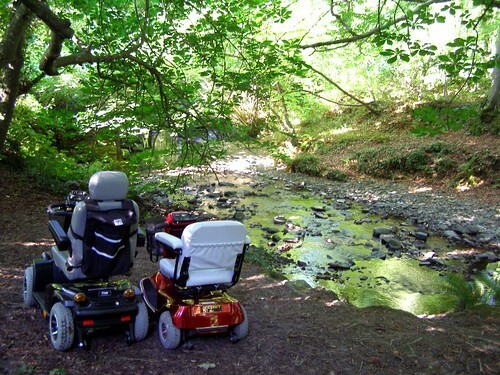 That some people will find it a novelty to see disabled people together, let alone being romantic, in public. That some people will find it cute and some people will find it weird. That people will undoubtedly gossip about us. Stephen says there are places where it would be a bad idea for us to hold hands because of other people - and not just to avoid crushing their toes. I know this is true, but I also notice advantages. So far we've always been out together in a fairly rural environment where lots of people speak to us, yet nobody has made comments about speeding (ha ha ha) or learner-drivers (ho ho ho) or any such thing - even when Stephen has been using the bright yellow borrowed “power trike” which looks very cool and can go very fast (you can't hold hands with that either, as it has manual brakes). My hope is that together we exude confidence, and people don't feel the need to say a thing about our wheels. Either that or they have merely been terrified into friendliness and courtesy. Incidentally, Wheelchair Dancer has written a little about the possibility of intimacy in being pushed, at the end of a post about the crapness of being pushed the general crapness of being pushed. So sweet! And excellent photos too. Those who dare hopefully make a path for those in doubt. As time passes I find more wrong with it, not the least the use of the word "free" which ignores that People at King Street are probably proportionally among the most highly Taxed People around (king Street is District Health Board Funded. I ranted in my blog over it but wondered what you'd make of it. Having written this post, a few days later, a man we passed decided to treat his twos teenaged sons with a running commentary on the "race" between our two scooters. He didn't talk to us at all, but joked about us well within our earshot. I hope the boys were mortified. This post reminds me of how frustrated I used to get when I couldn't hold hands with my husband. Either I was pushing, he was pushing or his hands were occupied with holding onto crutches and remaining upright. As far as people being judgemental, well they can piss right off can't they?